Some really simple things which you would never think of till you see somebody else do it and then think - Oh, yes! This can be done this way too! Now why didn't this occur to me? The humble orange peel for example, which finds it place in the trash can most of the times, meta morph into a lovely candy? Google led me to Smitten kitchen when I asked for some candy recipes. What do I see there among other gorgeous candies - Orangettes! Orange-what?? Never heard of them or tasted them earlier. 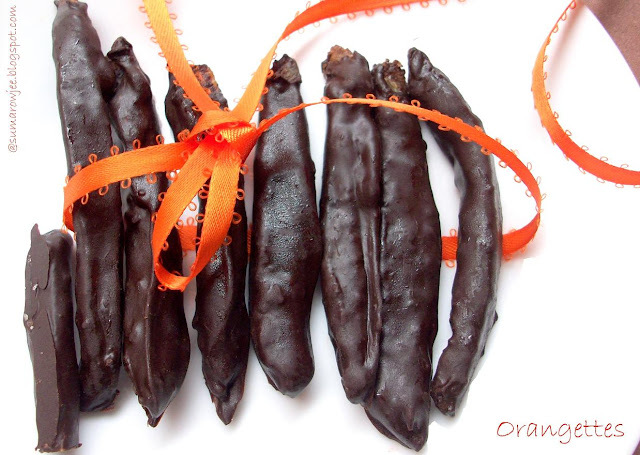 New to me, these are candied orange peels dipped in chocolate, pretty enough to gift when you do a neat job. When you do a sloppy job like me, they are great to store in the fridge and pop a couple of them when dessert craving strikes. If you think orange and chocolate marry well, then you will love having these on hand. These are quite easy to make, but time consuming, more so if you want to make them in large quantities. But then, with the intense flavor of orange within the orangettes, it would not be possible to eat too many of them at one go, at least in my case, so that's a kind of consolation. 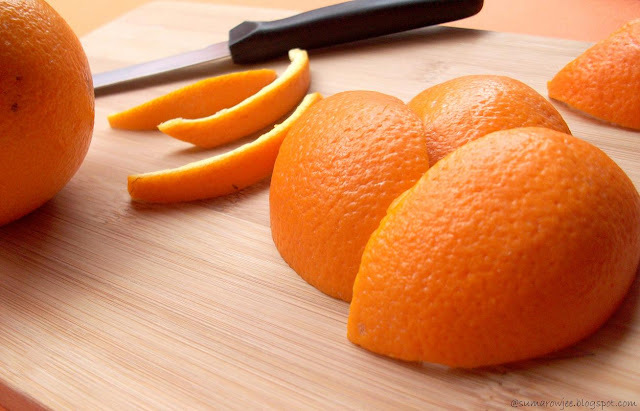 For the the time spent, even with just 2 oranges, you can eat them well over a couple of days time. The outer layer of dark chocolate snaps when you bite into them, the ever-so-slightly chewy sweetish orange peel within .. Humor me if you see more than just a splash of orange here this season but I have a few things on my mind which hopefully I will do soon. And when I find a simple recipe like this bang in the orange season, what's really to stop me from trying it out? What we need to do is quarter the outer peel of the orange, cut them into strips, blanch them in boiling water twice or thrice to remove the bitterness. Then cook the peels in simple syrup, allow them to dry. This makes candied orange peel. To transform them into orangettes, dunk them in a pool of melted dark chocolate and let them set. That is it! Recipe adapted from Deb's Smitten Kitchen. I made half of the recipe, the only change I made is a reduction in the amount of sugar. Baking parchment to dry the candied peel on. Procedure: Take a sharp knife and cut the outer layer in an X shape to divide the entire orange into 4 quarters. Remove the peel carefully and cut again into strips, try and keep them uniform in width to help even cooking. 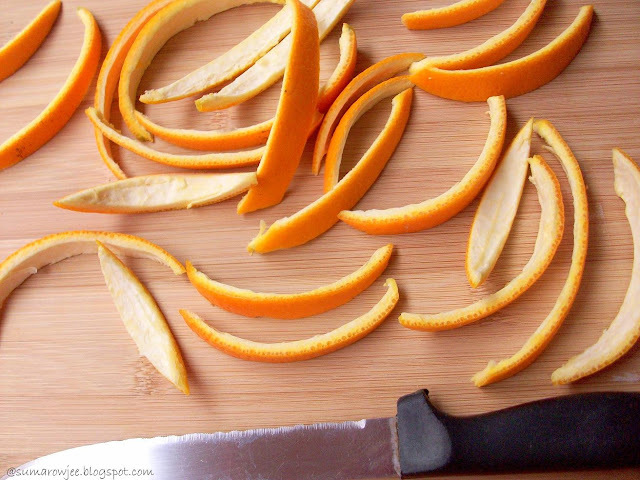 If you want them to look pretty, make an oblique cut at the edges so that the peels don't have sharp 'tails'. In the meantime, in a large saucepan, bring sufficient water to a boil. Tip the peel into this, the water must cover the peels. Boil for about 5-6 minutes and then drain. You are supposed to rinse them at this stage, but oops! I forgot to! Repeat the process again with fresh water. This helps remove bitterness from the peels. Taste the peel, if it is still bitter, blanch once more. I blanched twice and there was only a barely there bitterness, so I did not blanch again. Drain the peels and set aside. In a heavy saucepan, combine the sugar and water. When it simmers, add the blanched peel, cover and cook on low heat for about half an hour. If you vary the number of oranges, the cooking time will vary too. Keep checking in between, making sure you cover the lid again. Try not to stir, as it may introduce sugar crystals. Swirl the pan if needed. Another point I overlooked, were mine slightly crystallized? At the end of the period, the syrup will almost be absorbed and your orange peel will be shiny, translucent and beautiful. Be careful not to let the peels get burnt. Don't allow the sugar to crystallize unless you want it that way. Transfer the peels to a cooling rack to allow any excess syrup to drip and dry. They will be very hot with the syrup, so be careful. I let them dry for about 2 hours. Line a large baking sheet with parchment. Melt the chocolate over a double boiler or in the microwave. A smallish bowl kind of container will work better, giving you more of fluid chocolate to dip the peels in, giving them a smoother finish and a thinner coating of chocolate. I did not do a great job here of course as I was too lazy to find the most suitable microwave safe container and make did with whatever was washed, dried and did not smell of leftover pasta. I would prefer a thin coating of chocolate as a thick one would overpower the taste of orange. Place the orangettes on parchment, allow to dry and set. If you want them to set faster, keep them in the refrigerator. I have stored them in the fridge. Please note : The original recipe has equal parts of sugar and water, I have reduced it from 1/2 cup to 1/3 cup. This made the peel slightly sweet, but not overly so. If you want them sweeter, use 1/2 cup sugar. Adding corn syrup to the peels while they cook in the syrup is supposed to help avoid crystallization, I haven't tried that..
On another note, Cakes And More will shortly turn 2 and I am planning an event and a giveaway soon! Stay tuned for the announcement! I really wish you posted this earlier, these look beautiful...I just made some candied orange peels and had such a tough time removing the pith and then getting them out of the pan once they were done :( they tasted alright though, plan to use them in a cake...Check Sayantani's blog for a orange candle,its so pretty ! What a wonderful use of peels... will surely try it out !!!! These look lovely! I see that you have used the peel of tangerine which I what I should have done when I tried candied peel last year..i used regular orange peels which broke for some reason. I will definitely give this a shot! Thanks for the recipe! Oh ! Great ! Lovely idea. If you scrape the white pith, then maybe you dont need to put in water 2-3 times. At t most once, as it wont remain that bitter. I tried this once but mine turned out to be quite bitter...but now I know should have blanched them before putting into sugar syrup. looks wonderful and yes orange and chocolates make a killer combination. If i make these fabulous orangettes, i wont stop having them,well done Suma. made the orange-choco candies at home. everyone liked them at home. Love it! Just right for this season and something I need to do on priority! 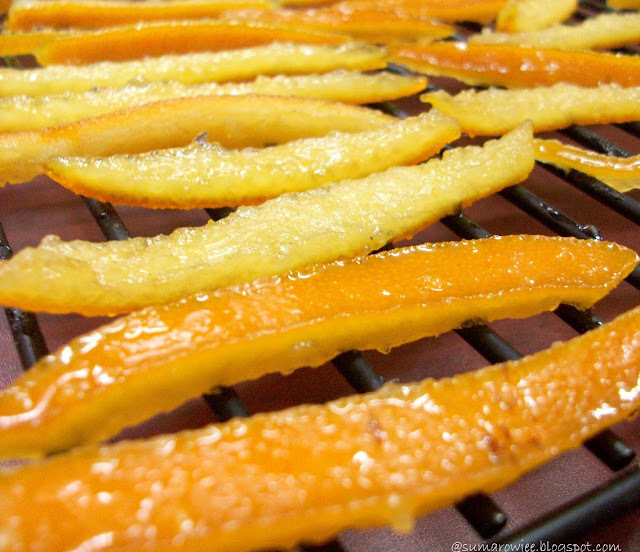 The first time I candied orange peel, it crystallized, and I loved it that way - but I can't figure out how to reproduce it! When I cook until all the syrup is absorbed, then I get hard & brittle instead of dry & sugary. HOW do I "allow" the sugar to crystallize?! I have only tried the store bought version so far. Yours looks so incredibly good.